The roashouse was amazing! It felt like home. Everyday they had fresh baked cake, free coffee tea and hot chocolat. The staff made us feel so welcome and everyday there were activities at night. Bathrooms and kitchen were very clean and we loved our beds wich had a curtain so you feel like you have your own private space. Thank you for making this weekend even better! Absolutely loved my stay at The RoadHouse Prague. Lewis man you personality is so awesome! Loved George's his cooking and taking us for some chupito's!! Made some great friends here and I will definately come back next year but then for a longer stay! Greetings Stijn! Amazone hostel, best one I’ve ever stayed in. Staff feels like a family, they welcome you in their home and you’ll have a great time. Definitely was sad to leave. One of the best hostels I have ever visited! It's small (2 rooms) but cozy, clean, new and friendly. 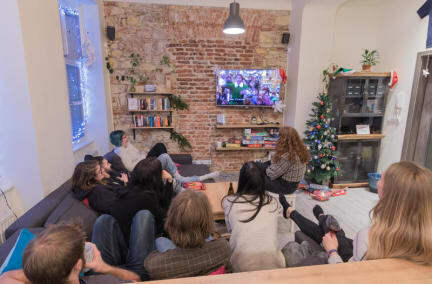 Because the owners also own an other hostel (more party), you have the option to combine the best things like joining a tour or pubcrawl without the craziness of that type of place. You can join a family, home cooked meal. 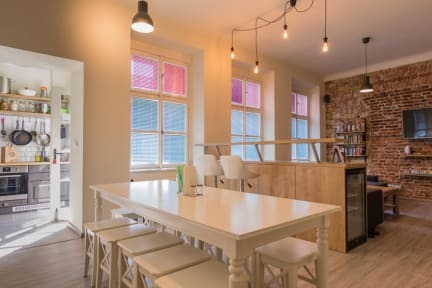 When you're looking for a quiet, friendly and cozy hostel with the option to party, this is one of the best. The people working there are really enjoying their work and atmosphere and even hanging out on their day off.